Just got the sad news from my dear friend Doug Payne. I can't believe. I'm devastated. 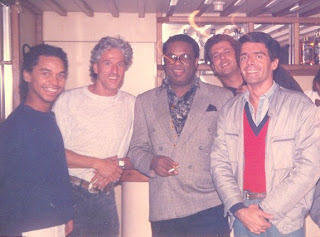 I'll miss Freddie Hubbard forever. Yesterday I listened twice to the CD reissue of "The Love Connection", which, in fact, I have been listening to obsessively for the past month, along with other Hubbard albums I had been posting here during all this month. Recently I found out that "The Love Connection", magnificently arranged (& co-produced!) by Claus Ogerman, was the one who represented Freddie Hubbard in the "peak of the peak" of his form, at the height of his powers, even more than any of his CTI dates that I adore. It's passionate + technically impeccable playing from the first to the last note. He was my favorite trumpeter. I always considered Miles Davis more "important", because of his revolutionary spirit, something that I've always admired. But Hubbard was MY personal favorite. The first one I began to collect when I was 9 or 10, and my passion for CTI began. The first LP I bought on which he was featured was Stanley Turrentine's "Sugar", with liner notes by Ira Gitler. Two days later I found Milt Jackson's "Sunflower", whose intro of the opening track, "For Someone I Love," I used to listen each and every midnight as the theme of the "TAP Pelos Caminhos do Mundo" program on the JB-AM radio in Rio. Then I got Hubbard's own Grammy-winning "First Light" (with Airto Moreira on percussion), followed by "Sky Dive," "Polar AC," (both also featuring Airto) "Red Clay" (his CTI debut) and "Keep Your Soul Together". Many years later, thanks to Doug, I also got the original vinyl pressings of the two "Hubbard/Turrentine In Concert" volumes, as well as of the compilation "The Baddest Hubbard". It was a dream come true when I produced him in studio for a track for the Roberto Avila album in 1989. Later on, I had the chance to include Hubbard's tracks in compilations I produced (most notably the best-selling "CTI Acid Jazz Grooves" in 1997) and I supervised some of his CTI reissues for the Asian market. I regret the fact that his eagerly awaited "comeback album for CTI", which started to be recorded in '97 with arrangements by German pianist Jurgen Friedrich, was never completed, although JazzTimes magazine devoted a cover story to it. The track selected to be the first single was a jazzy version of James Horner's "My Heart Will Go On", the love theme from the "Titanic" movie. Besides "The Love Connection" and all his CTI sessions as a leader, as a sideman (with Milt Jackson, Kenny Burrell, Don Sebesky, George Benson, Randy Weston and Stanley Turrentine) and and as a member of the CTI All Stars, I strongly recommend Hubbard's albums with Woody Shaw (when he re-signed with the ressurrected Blue Note label), the superb live dates with the VSOP Quintet (specially "Live Under The Sky" and "Tempest in the Colosseum"), and a haunting track ("Portrait of Jenny", backed only by Dorothy Ashby's harp and David Garfield's celeste) from "Bundle of Joy", one of his many controversial albums for Columbia, the label for which he also cut the excellent "Super Blue" (reissued on CD inaugurating the Mosaic Contemporary label), the explosive live date "Gleam" released only in Japan (including a great version of Stevie Wonder's "Too High") and many studio dates like "Liquid Love", which featured Brazilian percussionist Mayuto Correa. Another renowned Brazilian musician, Paulinho da Costa, played congas on "Bundle of Joy," whose title track sounds like the perfect freeway soundtrack while driving from West Hollywood to Venice Beach. And Hubbard guested on Raul de Souza's best-selling album ever, "Sweet Lucy," (Capitol) for which he also wrote the liner notes. From his early years, besides several good-to-very good albums as a leader for Blue Note and Atlantic, the highlights are the appearances as sideman on Oliver Nelson's "Blues and the Abstract Truth" and John Coltrane's "Africa-Brass" (both produced by Creed Taylor, originally released on the Impulse! label and reissued in the 90s on CTI), as well as the historic Ornette Coleman's "Free Jazz" (Atlantic). Not to mention two other Taylor-produced Quincy Jones sessions, "Walking in Space" and "Gula Matari", both from the A&M/CTI era. 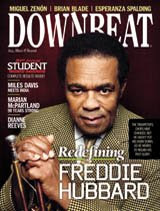 Last June 2008, Hubbard was the cover story of DownBeat magazine, in an article about his 70th birthday and the making of his last album, "On The Real Side" (Hip Bop), done with the big help of fellow trumpeter David Weiss. 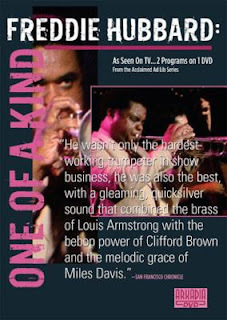 A "new" Freddie Hubbard DVD, titled "One Of A Kind", is scheduled for release by the View Video company in the USA on January 20, 2009. The DVDs filmed live at the Village Vanguard (previously released on LaserDisc) and at the Varsaw Jazz Festival are still available. Two other LaserDiscs, "Freddie Hubbard Live at the Blue Note" and "Wolf Trap Salues Dizzy Gillespie - An All-Star Tribute to the Jazz Master" (on which Hubbard performs humiliating solos on "Tanga" and "Tour de Force") are still awaiting a DVD reissue. 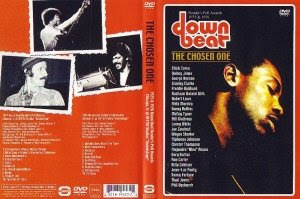 I also recommend the DVD "The Chosen One / DownBeat 1975 & 1976 Readers Poll Winners", on which, among other numbers, Hubbard plays a furious version of "Straight Life". I hope that someday some Japanese label could release the videos broadcasted by NHK TV from his performances with the VSOP and CTI All Stars supergroups, as well as his concerts as a leader in the Aurex and Live Under The Sky Festivals. 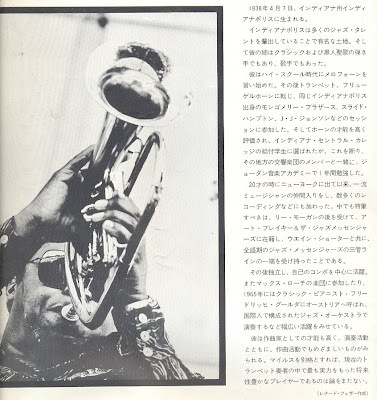 "Freddie Hubbard was, I believe, the greatest jazz trumpet stylists of my generation. His influence is still being felt in the sound of many young trumpeters today. His warm tone and formidable technique will be considered marvels well into the future.Personally, I was so fortunate in that Freddie played on my very first album as a leader "Takin' Off". He was exactly the person I wanted and his contribution was groundbreaking. On a tune called "One Finger Snap" on a subsequent album of mine, his beginning improvised solo line worked so seamlessly that it became a kind of generic "melody" that most musicians still believe was the composed melody, when in fact it was not.